Make this traditional Cornish pasty from The Poldark Cookery book and have your very own Poldark picnic! Author of The Poldark Cookery Book, Jean M. Graham shares the history of the Cornish pasty, and a traditional recipe so you can make your own version from the book. Why not bake one while watching season three of Poldark on PBS? The now famous pasty came into existence towards the end of the eighteenth century. According to the St James’ Chronicle they were for the ‘lowest sort of people’ and comprised no more than ‘vegetables wrapped up in a black barley crust’. The pie is older fare than the pasty in Cornwall, but the pasty was found to be more convenient for the miners and farm labourers to take to work and eat at mid-day. In early times they rarely contained meat (indeed many families had meat no more than once or twice in three months) and were made primarily of turnip and potato. As time went on, they became more nourishing and sophisticated and endless variations of filling were devised. I particularly remember rabbit pasties, in which the ribs of the rabbit were used to hold out the pastry! 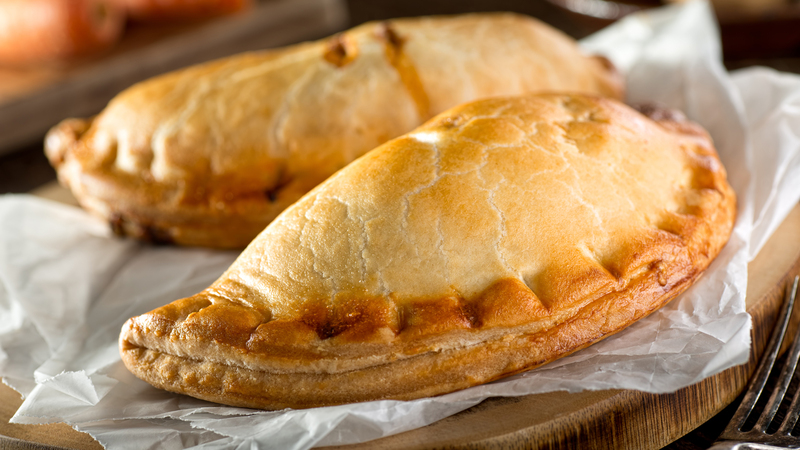 Pasties can have sweet fillings too – apple and blackberry or jam – and they would then be served with sugar and cream. Pasties do not feature greatly in Poldark fare; they were served at the Warleggans’ House with cakes and jellies, syllabubs and fruits, punch and wines and tea and coffee after the Lord Lieutenant’s Ball; see Demelza: Book Two, Chapter XI. 1. Sift the flour into a bowl with the salt. Cut the fat into the flour (don’t make the pieces too small). Make sure each piece of fat is coated with flour. Add the water and mix together with a palette knife to a firm, non-sticky dough. 2. Flour a pastry board and rolling pin and roll out the pastry into an oblong piece. Fold into three, and give the pastry a half turn, so that the folded edges are on the right and left. Repeat the rolling and turning until the pastry has been rolled five times. If possible leave for 15 minutes in a cool place between the rollings and before using. The ingredients for a meat pasty must be raw – you cannot use any cooked left-overs from a joint. The best type of meat is sirloin skirt because it has fat running through it and this makes it tender. To make this pasty vegetarian, swap the quantity of meat for cubed turnip. 1. Roll out pastry about 5 mm (¼ inch) thick and use a plate to cut out a circle of about 15 cm (6 inches) diameter. 2. Chop the meat finely, peel and thinly slice the potato and onion. Put the potato slices in the middle of the pastry; cover with the meat and sliced onion. Season well. 3. Moisten the edge of the pastry with a little water and bring edges up across the filling. Pinch together firmly. 4. To make the crinkle, hold the edges of pastry firmly with the first finger and thumb of the left hand, then twist the edges over each other with the right hand until they are firmly joined. You should have an oblong object, like a closed purse. 5. Brush over with milk and put on to a greased flat tin. 6. Bake at 230ºC (450ºF) Gas 8 for the first 20 minutes then lower temperature to 190ºC (375ºF) Gas 5 and bake for a further half an hour. Enjoy with a pint of West Country cider! Filled with the food that would have been enjoyed by Ross Poldark and Demelza in the eighteenth century, this recipe book is the perfect present for the Poldark super-fan.